Hamas has rebuffed threats to halt international aid to the Palestinians, saying that it will continue its current strategy towards Israel. The EU, US, Russia and the UN called on Monday for Hamas to renounce violence and recognise Israel or face the prospect of cuts in global aid. 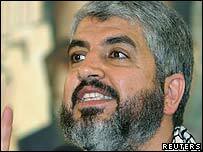 One Hamas leader, Ismail Haniya, said the "unfair conditions" would endanger the well-being of Palestinians. Israel has said it is likely to suspend payments of tax revenues due to the PA.
A regular monthly payment of about $50m (£35m) is due to be transferred to the PA on Wednesday, but could be held back pending the result of a high-level review, Israel said. Meeting in London, the Quartet of would-be Middle East peacemakers confirmed that aid to the Palestinians totalling more than $1bn (£563m) could be jeopardised if Hamas refused change. The EU gave some $600m (£338m) in aid in 2005, while the US handed over $400m (£225m). "Hamas is immune to bribery, intimidation and blackmail," Khaled Meshaal, the movement's overall leader, wrote in the UK's Guardian newspaper. He called on Arab states to increase aid to the Palestinians. Hamas' political head in Gaza, Ismail Haniya, insisted international aid was vital humanitarian assistance for people living under occupation. "This aid should not be linked to unfair conditions," he told the AFP news agency. Instead Hamas called on Israel to change, repeating demands for an end to the occupation of Palestinian land and attacks on Palestinians. Some now believe that in the light of the West's warning, Hamas may be determined not to be seen to bow to outside pressures, says the BBC's Alan Johnston in Gaza. Saudi Arabia, the Palestinians' biggest Arab donor, also believes the international community are being "unreasonable". "The European Union insisted on having elections in Palestine, and this is the result of what they asked for," Saudi Foreign Minister Prince Saud al-Faisal told reporters in Malaysia. "Now to come around, and say [they] don't accept the will of the people that was expressed through democratic means, seems an unreasonable position to take." Prince Saud said he believed Hamas would act responsibly in government and that all parties needed "cool heads... rather than reactions that close the door to peaceful settlement". 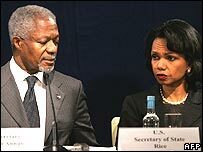 The Quartet's statement, read by Mr Annan, said: "All members of the future Palestinian government must be committed to non-violence, recognition of Israel and acceptance of previous agreements and obligations, including the roadmap." It said future aid would be reviewed in reference to these demands, but did not threaten to cut it in the short term. The BBC's diplomatic correspondent, James Robbins, said the words were chosen with care. They did not demand a renunciation of violence or immediate recognition of Israel, but a commitment to these things in the future. Palestinian leader Mahmoud Abbas, who has urged donors not to cut funding, is expected to meet Mr Meshaal in the Egyptian capital Cairo to discuss relations with a Hamas-led government. Mr Abbas left Ramallah on Monday for talks in Jordan before travelling on to Cairo, where he is also due to meet Egyptian President Hosni Mubarak.